Richard Branson, creator of the Virgin conglomerate which owns all of your airplanes and music-makers, lost a bet with fellow billionaire Tony Fernandes. The result is the terrible monstrosity you see here. Way back in 2010 (remember then? I can't remember then. SO SO long ago) Branson owned a Formula One team as well, called Virgin Racing. Fernandes, Asia's version of Branson, also owned his own F1 outfit, Team Lotus. When you both own F1 teams and airlines and have billions in the bank, the only gentlemanly bet is obvious. Whoever's F1 team won more points would be forced to act as a flight attendant (female, of course) on the winner's airline. Team Lotus finished higher in race positions than Virgin Racing, and today, three years later, it was time for Branson to pay the piper. 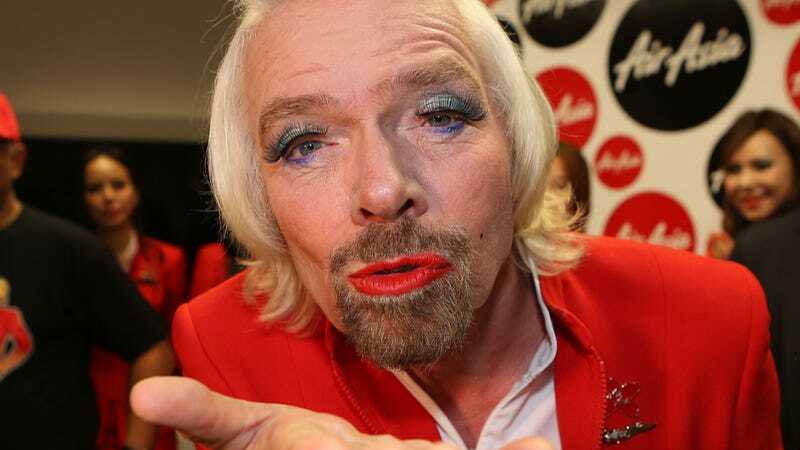 Branson had his legs shaved (he didn't shave his own, that's only for the Poors), put on some ravishing red lipstick, and put himself into a skirt and what appear to be fishnets for his stint as a stewardess. But he earned a reprimand from AirAsia chief Tony Fernandes after he deliberately dumped a tray of orange juice on Fernandes' lap. "He looked at me, I said, 'don't you dare,' and the next thing I know, he tipped the whole tray on me," Fernandes added. "He and the girls mopped it up, but I was walking around the flight in my underwear for a while because I didn't bring another pair of trousers." Just imagine that tubby magnate walking around with no pants on for more than an hour while trapped in a metal tube.